A Metro School Board member has given notice that she plans to bring a motion to terminate the contract of embattled Schools Director Dr. Shawn Joseph. 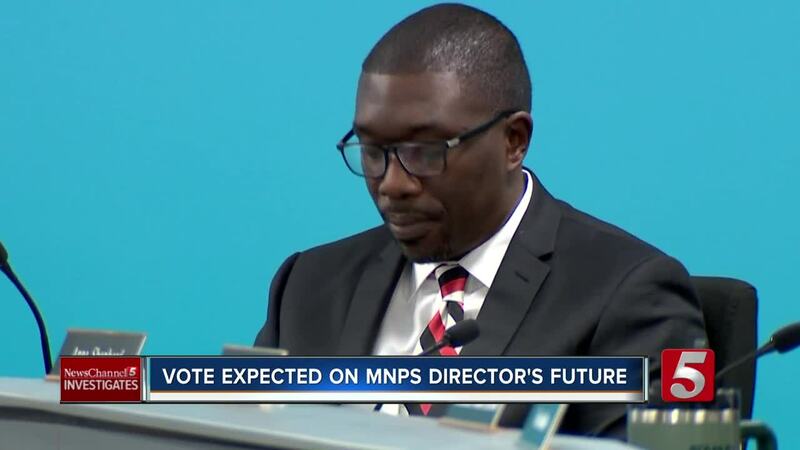 NASHVILLE, Tenn. (WTVF) — Will Pinkston, an often combative member of the Metro School Board, announced Monday that he is resigning from a board that he says is "chronically ill in ways that will not be easily cured." The announcement came on Twitter, where he had spent the weekend threatening not to support a pay raise for Metro Schools employees because of criticism he had faced from some of them, even attacking a principal who had politely asked him to put his personal feelings aside. "With minimal regret, I am resigning from the Metropolitan Nashville Board of Public Education, effective April 12, 2019," Pinkston said in a letter to school board chair Sharon Gentry that he posted on Twitter. "This year's mind-numbingly irrational conversations about the Director's contract, evaluation and the FY2019-20 budget have led me to conclude the board, in its current configuration, is impossibly inept." Pinkston has become notorious for attacking critics on Twitter, calling them "nitwits" and threatening to report them to Metro Police for harassing him with critical emails. In his resignation letter, he accused his colleagues - without any evidence - of "racially motivated attacks" on Schools Director Dr. Shawn Joseph. Pinkston, who had chaired the board's budget committee, blasted his colleagues for a discussion during a retreat Friday on whether to ask the Metro Council for a 6-10 percent pay increase for teachers and other employees. Board members argued that, even if that request was rejected, they needed to be blunt in telling city leaders what was needed. "I cannot in good faith, or with a straight face, proffer a budget to the Mayor and Council that is shaping up to be pure fiction and ignores the city's revenue constraints," his letter states. Pinkston said he is immediately resigning as budget chair. Over the weekend, Pinkston continued his attacks on fellow board member Amy Frogge and other critics, suggesting their attitudes would affect whether he came down on the side of a 6 or 10 percent pay raise. "I wonder which side (if any) I'll come down on after being repeatedly harassed by Amy Frogge and fussed at by her cranky teachers and their angry husbands," Pinkston tweeted. John Trotwood Moore Middle School's principal, Dr. Gary Hughes, replied, asking the school board member to set aside his personal feelings when it came to teacher pay. "My teachers @JTMooreMS desperately need and deserve the largest raise possible," Hughes tweeted. "They give of their minds, hearts and souls daily for our children. This is no time for politics." Pinkston had recently declared that his own child would be attending Hughes' school next year. Responding to Hughes' tweet, Pinkston accused the principal, Frogge "and their ilk" of wanting to "bamboozle" teachers "with false promises." When Hughes replied that he would pray for Pinkston, the school board member lashed out again. "You are now just revealing yourself as a political operative who's inflaming board dysfunction and alienating parents," Pinkston tweeted. "To be clear: I will not recommend to parents that they entrust children to your care. Clearly, you are happy about this." When someone asked Pinkston why he had just bragged the day before about sending his child to John Trotwood Moore, he said "that changed today when Gary Hughes ... unexpectedly decided to wade into school board politics." "I'm now considering going magnet or private," Pinkston said. "JT Moore is no longer a viable option and I would encourage all parents to consider their options other than JT Moore." Pinkston had been behind a recent effort to extend Joseph's contract a year before its scheduled expiration. Then, when recent evaluations indicated that a majority of the board was critical of the schools director's tenure, Pinkston tried unsuccessfully to force a delay on consideration of Joseph's contract. His resignation letter did not acknowledge any role he might have played in the school board's dysfunction.